The National Museum of Natural History is part of the Smithsonian Institution, the world’s preeminent museum and research complex. The Museum is dedicated to inspiring curiosity, discovery, and learning about the natural world through its unparalleled research, collections, exhibitions, and education outreach programs. Opened in 1910, the green-domed museum on the National Mall was among the first Smithsonian building constructed exclusively to house the national collections and research facilities. Whether looking at the history and cultures of Africa, describing our earliest Mammalian ancestor or primate diversity around the world, examining ancient life forms including the ever popular dinosaurs, or exploring the beauty of rare gemstones such as uniquely colored diamonds, the Museum’s temporary and permanent exhibitions serve to educate, enlighten and entertain millions of visitors each year. Through its research, collections, education and exhibition programs, National Museum of Natural History serves as one of the world’s great repositories of scientific and cultural heritage as well as a source of tremendous pride for all Americans. The museum is open from 10:00 AM to 5:30 PM daily, but is closed December 25. The Museum extends its hours until 7:30 PM on certain dates. Admission is free to the museum and programs. 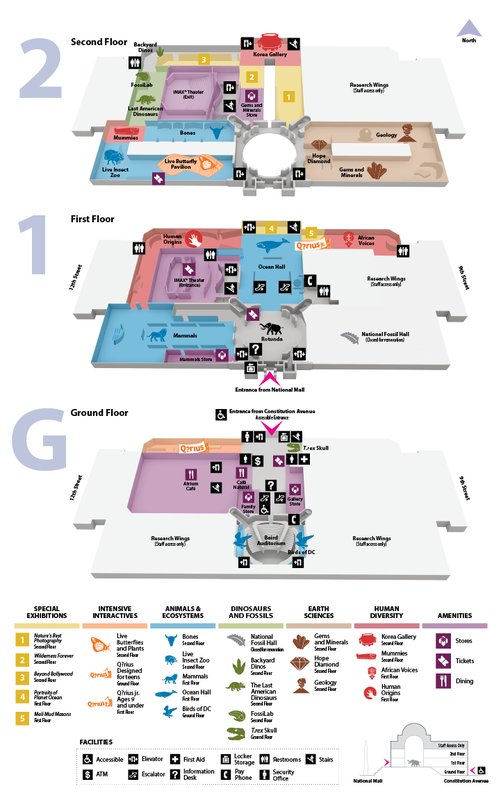 The Museum has accessible restrooms, an accessible IMAX Theater, cafeteria, stores. The National Museum of Natural History is committed to providing inclusive experiences for all audiences. Exhibition spaces are accessible to visitors with disabilities. The accessible entrance to the National Museum of Natural History is located on the Constitution Avenue side of the building. The National Museum of Natural History has courtesy wheelchairs that may be borrowed on a first-come, first-served basis free of charge for use within the building. Contact 202-633-3611 or email [email protected] for access services. When the “new” U.S. National Museum building, now known as the National Museum of Natural History, opened its doors on March 17, 1910, it housed art, culture, history, and natural history collections. At the time the Smithsonian was founded in 1846, its legislation provided for the National Museum. Spencer F. Baird, the first Curator of the National Museum and second Secretary of the Smithsonian, oversaw the development of the Smithsonian as the national museum of the United States. The Museum’s early collections included the artifacts and specimens from the United States Exploring Expedition, 1838-1842, and the collections from the great surveys of the American West in the 1850s, 1860s and 1870s. Today, the National Museum of Natural History cares for some 126.5 million artifacts and specimens both in the Museum on the Mall and at the Museum Support Center.